Click on ^Title^ to see the pics! 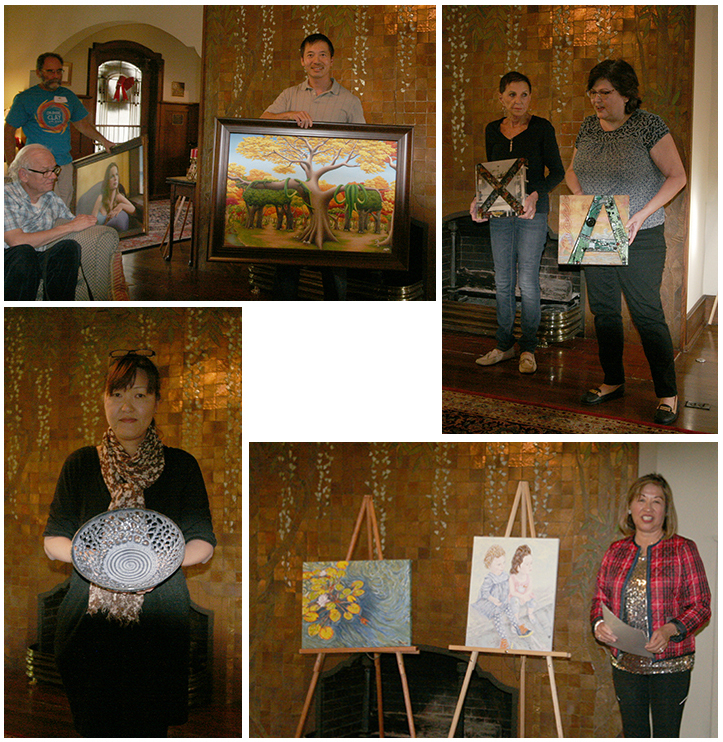 Four new members presented their art to the assembled membership. Robert Van Nguyen presenting his oil paintings. Leah Knecht (R) presenting her three dimensional artwork with the help of Jackie Steimke. Fumio Araki presenting her ceramics. Eileen Oda Leaf presenting her paintings.  The Pasadena Central Library invited PSA to participate in the March ArtNight event. Joan Di Giovanni, Associate Member and her guest Joyce Wedseltaft. 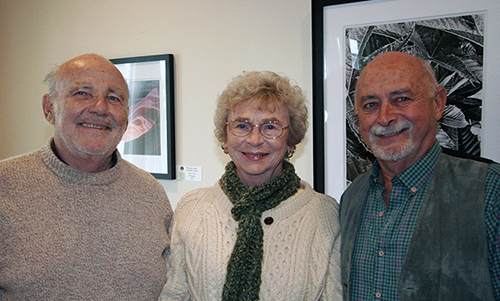 Vic Picou, Robin Cohen and Joanna Kos displayed some of their recent artworks. 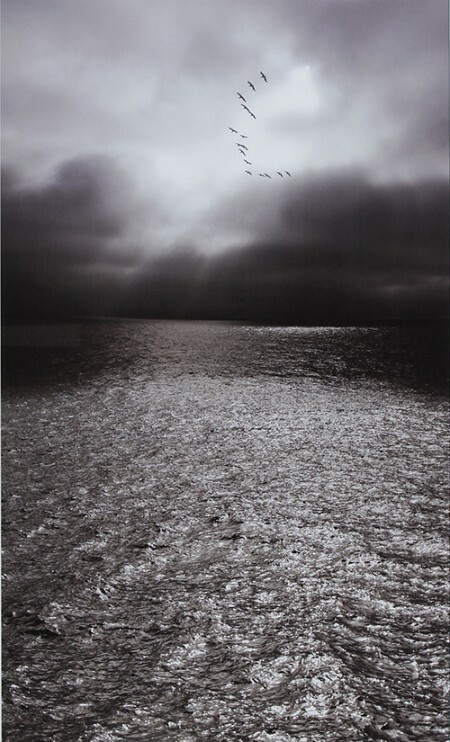 1) Member, Robert Michael Sullivan, admiring Victor Picou's artwork based upon the Oakland "Ghost Ship" fire & tragedy. 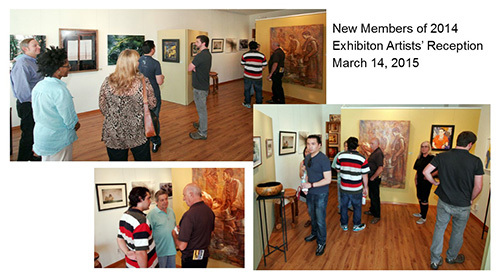 2) Victor Picou presenting his art to the membership. 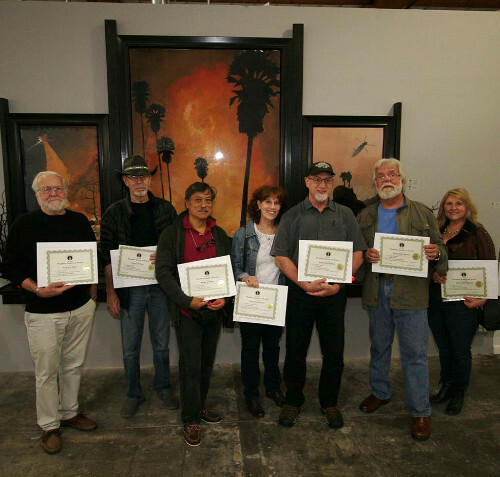 3) PSA member Richard Pina discussing his 30+ year career as a portrait artist. 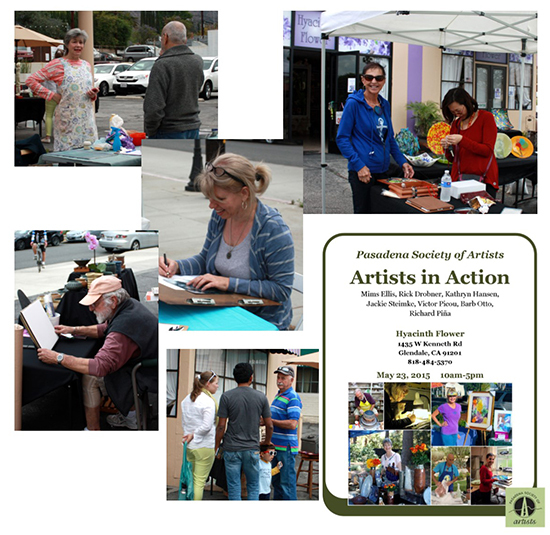 4) Richard begins work on his portrait of PSA member Jackie Steimke under the watchful eyes of several PSA members. 5) Further along in the portrait drawing. 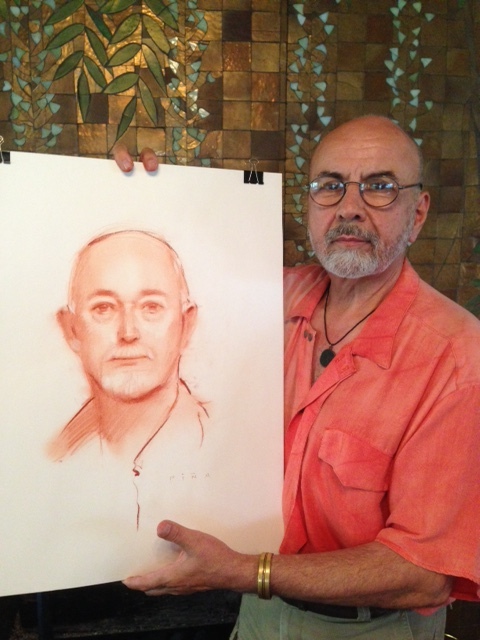 6) After approximately 35 minutes of drawing the finished portrait with model and artist. 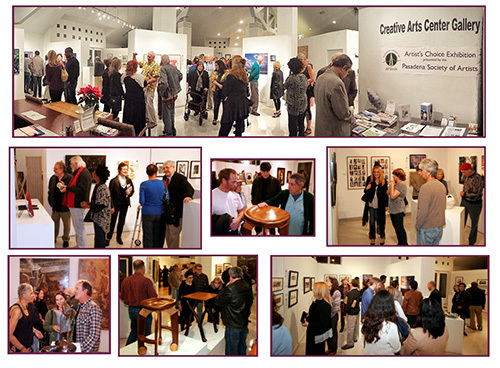 Several members presented their current artwork to everyone at the January 2017 General Meeting. Gina M showing her latest sculpture. 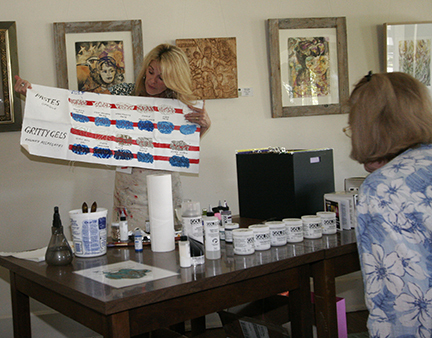 Chuka Susan Chesney showing one of several new mixed media paintings. Tom Oldfield showing one of his latest automotive themed black and white photographs. Kevin Hass showing his latest book of color photographs from Highland Park. 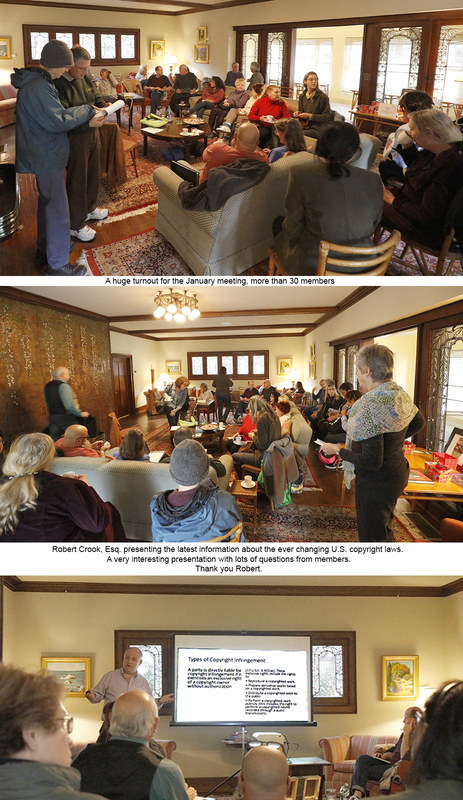 In our December monthly meeting, four new PSA members showed their work. 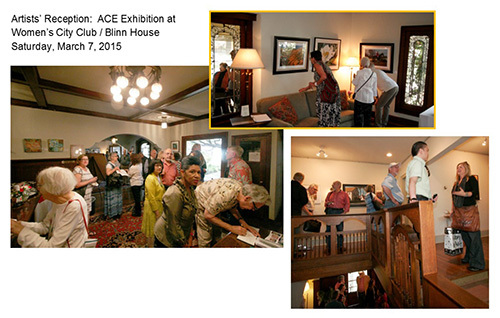 Bob and Arline Oltman, owners and founders of the Pasadena Museum of California Art, with PSA President, Vic Picou at the 2016 Spring Artist's Choice Exhibition at The Blinn House in Pasadena. Mims Ellis, Rick Drobner, Kathryn Hansen, Jackie Steimke, Vic Picou, Barbara Otto and Richard Pina demonstrated art techniques May 23rd at Hyacinth Flower in Glendale.